What do we call if it you intend to make a wearable muslin but end up making the real thing? Also will I ever overcome my aversion to organization and labeling so that I actually know what is what in my fabric stash? Someone may have an answer to the first question but the second question probably has no answer. In any case all's well that ends well for this project. I sewed a top for my friend Alice, in a roundabout way. Take a look at that lovely blue fabric - which she said she bought at Mood NY on our trip there a couple of years ago and she thinks was Liberty cotton. Ok, if you say so 😊. Because I went to try to this pattern for her, as an audition for a different fabric of hers which has been living in my stash (a solid color cotton/silk sateen which a luxurious sheen which we bought who knows where, also teal color). So I bought this New Look pattern which ticks a number of boxes for her, style-wise. 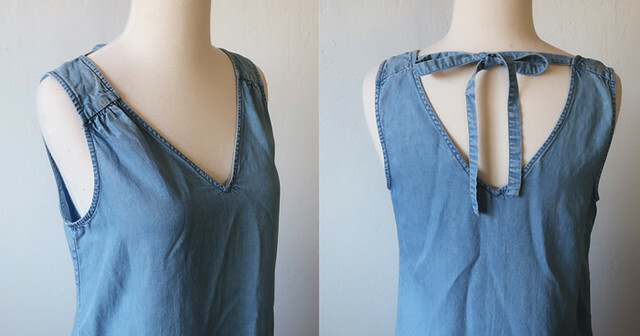 Wrap top, cut on sleeves, V-neck. And decided to give it a try. Some late night rummaging in my spare bedroom fabric closet and I came up with this. A couple of yards and I thought "oh that's nice - I wonder where it came from, probably one of my $2 fabric finds or a swap sale." And if I use this and make it for real (meaning reasonable nice finishing with all facings etc.) then she can wear it. A close up look at this very nice fabric. Here's the pattern. I made view C, same as shown on the model. I also like the long sleeve version which has a set-in sleeve although I could do without the neck ruffle which in combination with the sleeves is making it veer into pirate costume shirt territory. Here's a look on the dress form. If you look extra closely you might be able to see that I added a 2" band around the bottom of this top as it is definitely on the short side. Alice is quite tall but I tried it on as I was sewing it (of course) and thought it was short on me as well. I think that is part of the style but it seemed out of proportion for a top these days. Fortunately I had enough fabric to add that band which also gave a nice hem finish. Conclusion - super easy top which is great for a woven fabric you have lingering in your stash. Check the length if you don't like tops on the shorter side. And still we have sunshine and weather worthy of white jeans! Not complaining, other than the fact that we (always and forever it seems) need rain. And it's too warm to wear a wool coat!. But that doesn't mean you shouldn't make a coat or jacket with me next weekend, at my Coat/Jacket construction weekend class at Hello Stitch. I know for a fact that some people who are allergic to wool are making heavy cotton or corduroy jackets. All kinds of tips and tricks and construction details apply to any coat or jacket. Here's the link to register. What else am I working on? 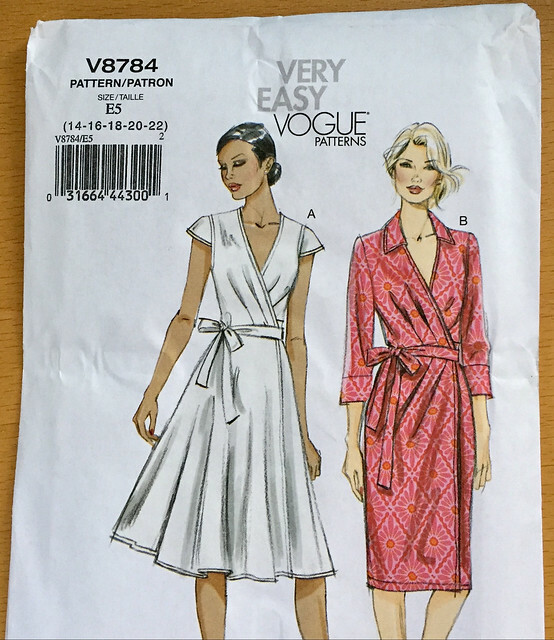 I am on the home stretch for Heather's silk wrap dress Vogue 8784 which will have a full blog post when I can take some photos of her wearing. 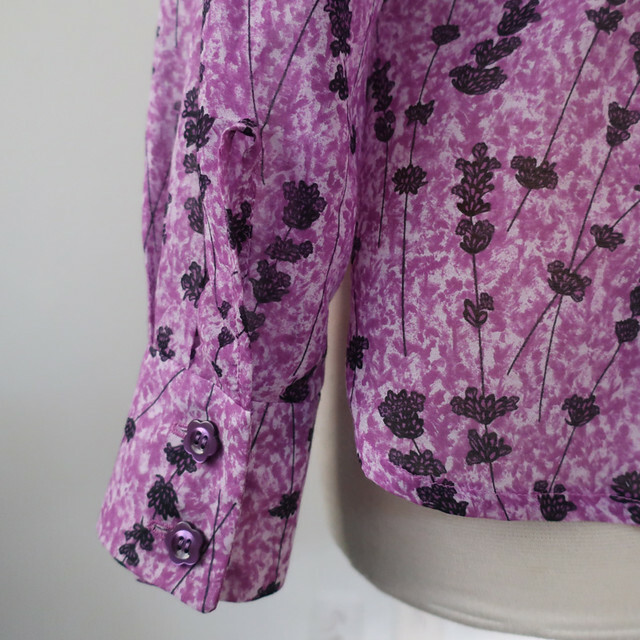 And I found a jacket in the closet in my sewing room - which I vaguely recall starting last winter for a previous session of my jacket class, and I guess spring intervened so I put it away unfinished. 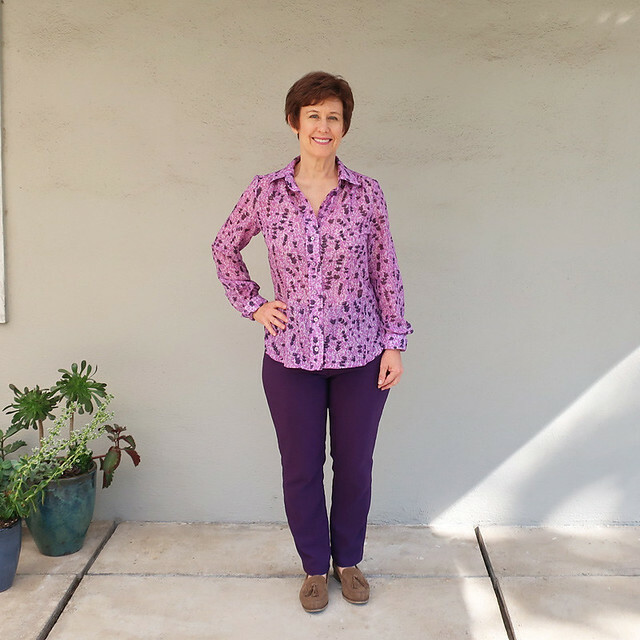 But now I sewed up a pair of stretch cotton jeans (using my own pattern copied from RTW jeans) and the color of jacket and jeans are an amazing match. Too suit-y? I will have to finish it after next weekend and see. By the way, in my class I will be demoing a lot of construction on a blazer jacket. I chose this pattern as it has a lot of details which are great to learn, such as welt pockets, lining, numerous darts, setting in a jacket sleeve etc. 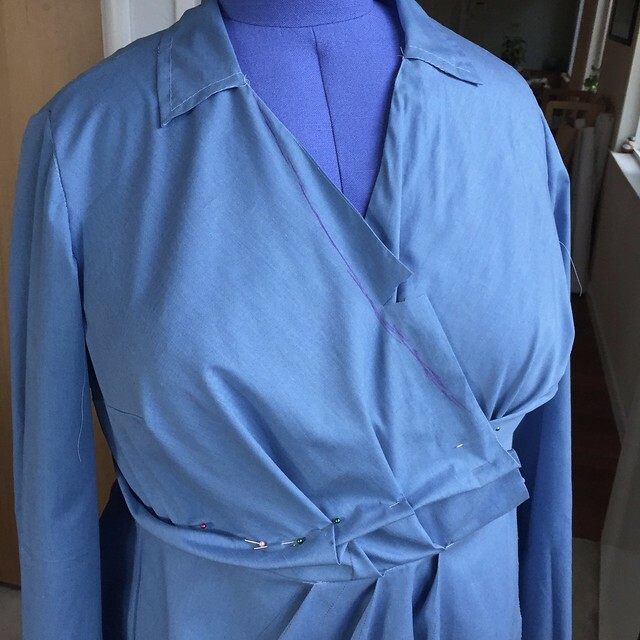 I made a muslin to test style and fit for Heather - so will be making a wearable muslin in a solid navy wool as a practice run for sewing up the wine color tweed she recently bought at Britex. And then it will be on to some selfish sewing - my Burda magazines have been piling up and I've seen a few really cute things I want to do. Plus it would be fun to participate in the #sewfrosting on IG which means I need to decide on something slightly frivolous and fun. While the sunshine holds up I will get out in the garden tomorrow - the battle with the squirrels and my tulip bulbs is continuing. And if you notice in the first photo, I'm really getting into succulents which are very satisfying - they are so easy to propagate. 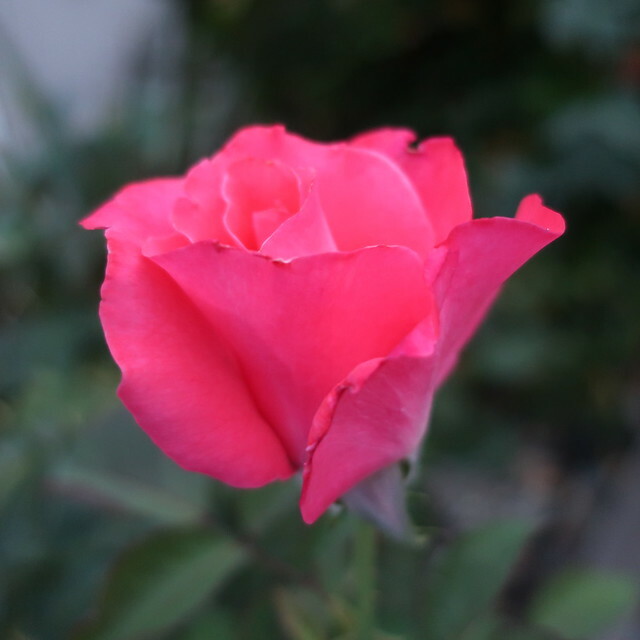 today's garden photo, there are still have a few roses around, some years we've had blooms up until Christmas. 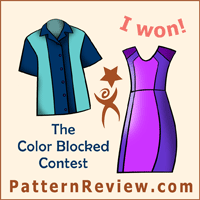 One of these days I'm going to use a different shirt pattern, but not this week. In fact I just rummaged around my pattern file and found a Burda tracing that I did last winter - which I scrapped mid-project due to the wrong fabric. That one became this top which I wear all the time. So I will try that Burda next but for this fabric my old standby of Simplicity 2339. And this might be version number 15? I've lost count but after all a button front shirt doesn't really change so why reinvent. 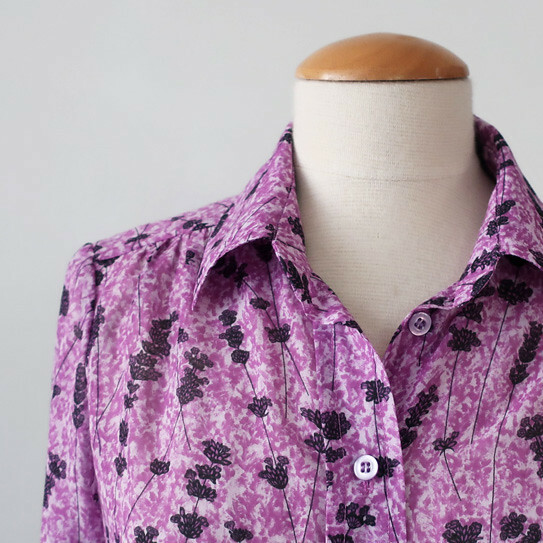 The novelty in this shirt comes entirely from the fabric, which is a 70%cotton/30% silk voile Liberty of London fabric. It's so light and lovely to wear, it feels like a feather. 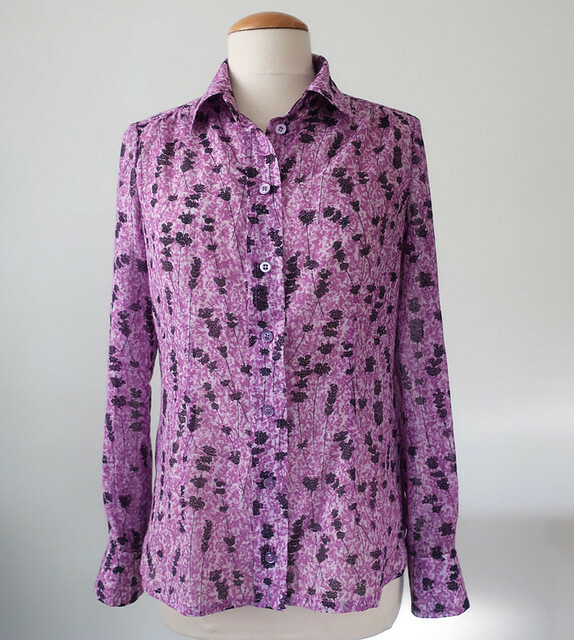 I sewed a shirt for someone else using this fabric which I found on the Mood website. and after completing that I had about 3/4 yard remaining. Since it's 52" wide that's a substantial amount. So I ordered another 1 yard so as to have enough to make a shirt for myself 😍 Because purple, right? 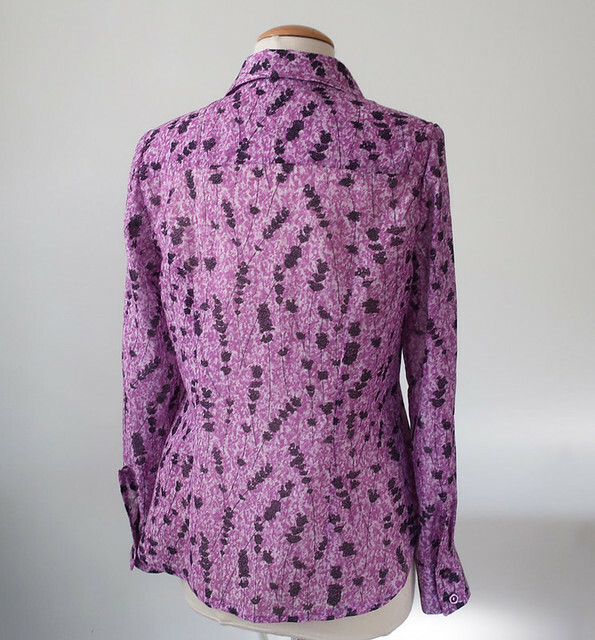 And lavender print. So garden-y. 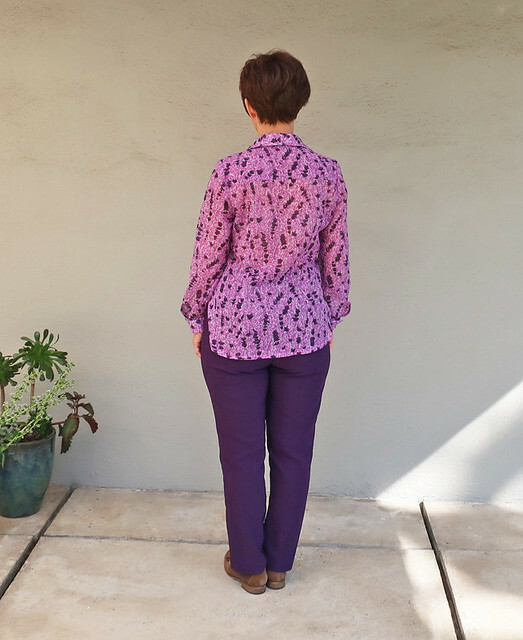 I had made these purple jeans late last spring, and they didn't get a lot of wear in the summer as they are a stretch bengaline (I think - at least they are some type of stretch woven, stretchier than stretch denim but not a knit. I classify them as bengaline because I received a swatch of the same type from Style Arc a long time ago and it was labeled with that name.) A very good fabric for pants, but a rayon-nylon-lycra so a bit too clammy for my summers here. But just right for fall and winter so I've been wearing them a lot. I like jeans that aren't jeans - in all kinds of colors. The pattern is my own, I made a pattern from a pair of jeans I own which fit just right. I should do a post about pants copying, one of these days. It's a good learning experience. So now I have a shirt to wear with my purple jeans. Here's a better look on the dress form. Based on my usual miserly tendencies when it comes to fabric spending, this was a bit of a splurge for me. So in total I paid more than $ 40 for the fabric. More than my typical $ 5 - 10 yard! I'm not a big spender when I comes to fabric and I don't really like to have a bunch around that is not specifically for projects but I'm glad I bought this as I just love the color and the lavender pattern makes me smile. Here's a closer look at the fabric of the jeans. I didn't do a bunch of topstitching on this fabric - topstitching doesn't look as it does on denim and I figured it was a timesaver to skip it. Here's a closer look at the front placket. I did the placket method I devised (which I copied from a RTW shirt) which is a continuous placket where a small pleat encloses the raw edges. If you look to the left of the buttonholes the shirt is actually all one piece, not a sewn on button band. Here's a look at the components during construction. 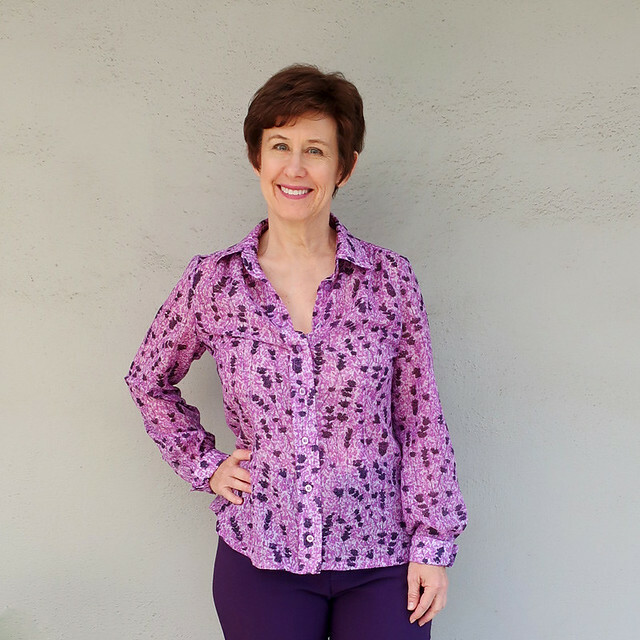 If you are really interested in this modification to a shirt front I did a step-by-step photo guide in this blog post. This fabric is so soft so I thought that a placket would be a bit tricky and I opted for a bias binding on the cuff opening. I think with every fabric you have to evaluate how it will work with various techniques or design features and be willing to adjust accordingly. 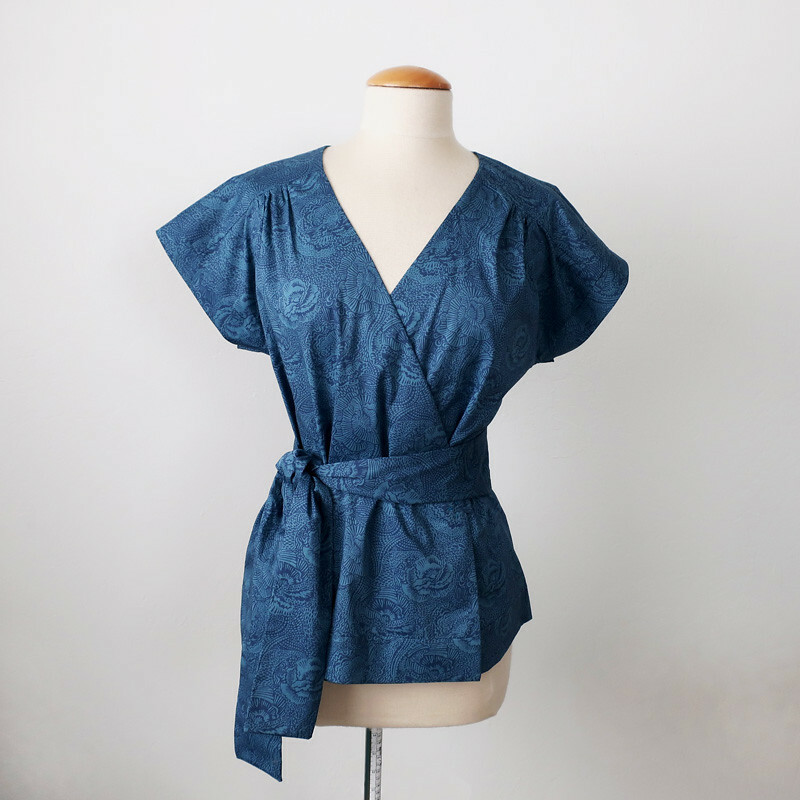 Up next, I am finishing a few things for Heather including that silk wrap dress which I talked about in my last post on fitting. And if I do say so myself - it is going to be gorgeous!! My jacket/coat tailoring weekend workshop at Hello Stitch is coming up on Nov 3-4 so if you have wanted to sew a jacket I hope you can make it. You will spend a weekend seeing me demonstrate all my tips, plus hang out in Berkeley and meet some great people who are as wild about sewing as you are. sign up here. Also upcoming is another session of Sew the Lander pants, and a kimono jacket class. 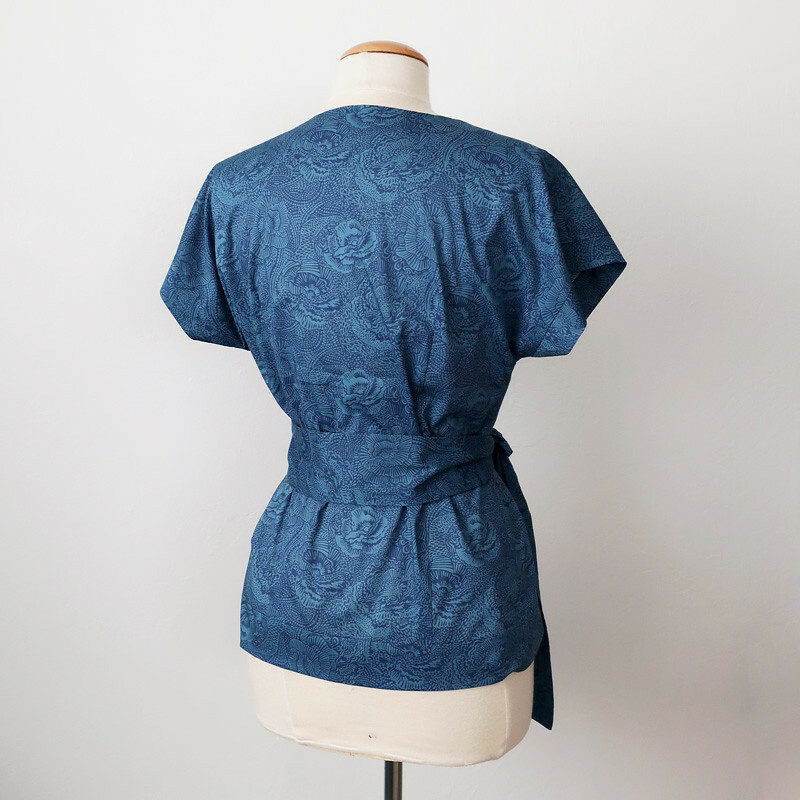 Look at the Garment Sewing page on HelloStitchStudio. I have some vague plans for another wool coat or jacket for myself but nothing firm at this time. Plus our weather has still been no-jacket-required so not really conducive to wintery sewing. Not complain ing about that! Still wearing shorts when out in the garden, planting bulbs under the watchful eye of the squirrels. 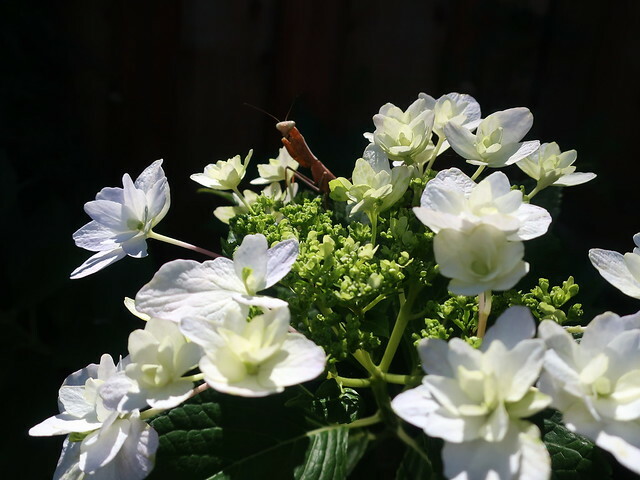 Today's garden photos. Multiple photos because this was one of those magical moments. 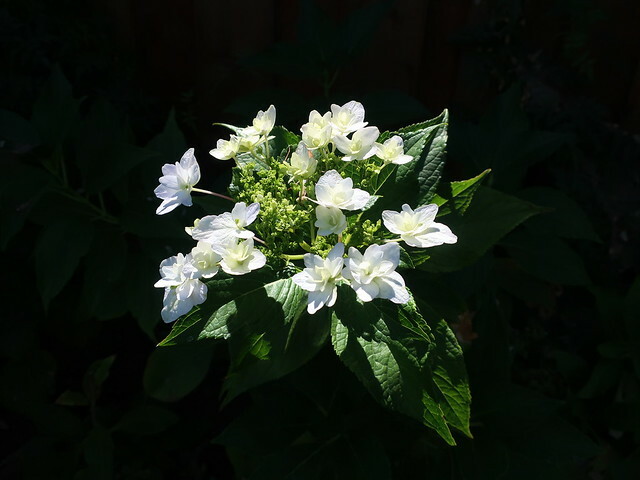 I went to take some pics of the shooting star hydrangea that had put out a magnificent bloom. And didn't even notice the visitor until I looked at the image on the screen of my camera. Glad I caught that and was able to take a few more. 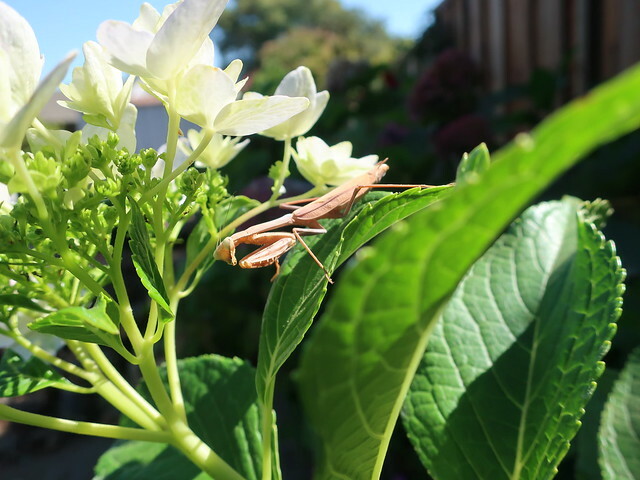 There's something about praying mantis, they seem to have so much personality. 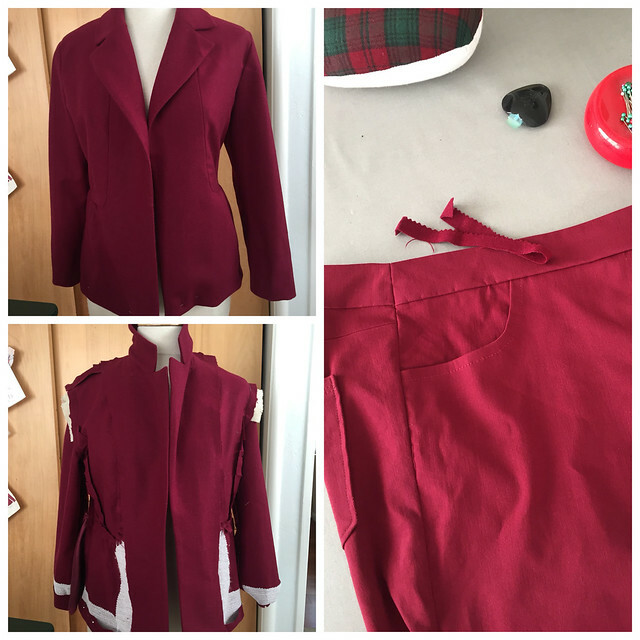 Back when I started blogging my sewing projects I would usually do a post on the construction and fitting details, and then a second post on the finished garment. 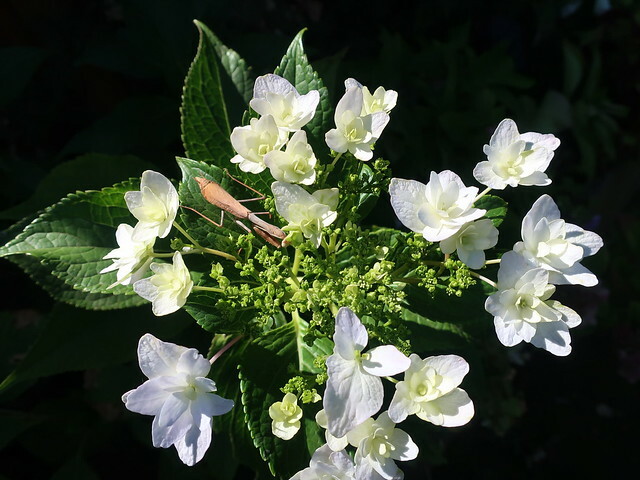 In the past year I have been a bit swamped and while I haven't given up blogging I have tended to just to one post per item. That one post might focus on some fit or construction details plus a good look at the finished garment. However I have been wanting to get back to some more in-depth blogging so this project is a good candidate. 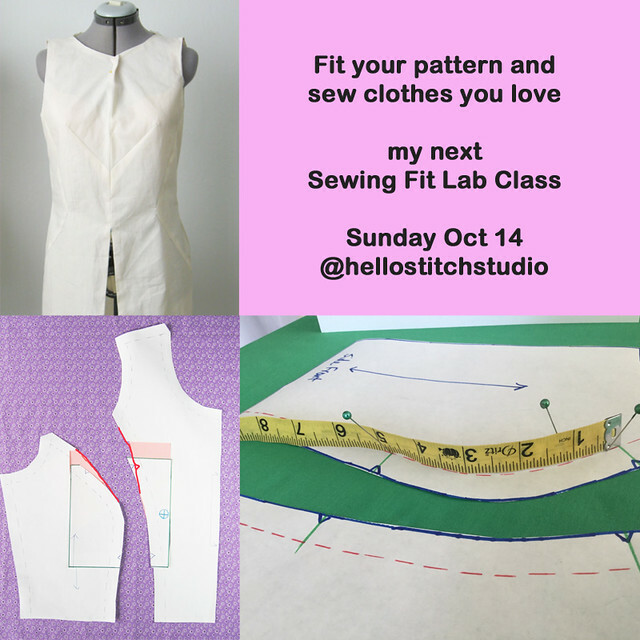 I'm teaching a Pattern Fitting Class on Sunday 10/14 at Hello Stitch in Berkeley and there are a couple of spots available. Last time for this year for the Fit Class so if you want to get your holiday pattern fitted I hope you can join us. (register for the Class + Fit Lab option to custom fit your pattern in the afternoon session). Ok, so what's the pattern today? It's this Vogue 8784 wrap dress. This is a true wrap dress, the front crosses over and the waist tie goes through the opening in the side seam. I like the variations, which are collar or no collar, cap sleeve or regular sleeve which you could make any length, and then two skirt options. Note that this pattern is designed for woven fabrics. It is meant to be fully lined and that is what I'm doing although I could easily see modifying it for a lightweight version (would only need to create a front facing for the bodice and skirt. I'm making this for my friend Heather. 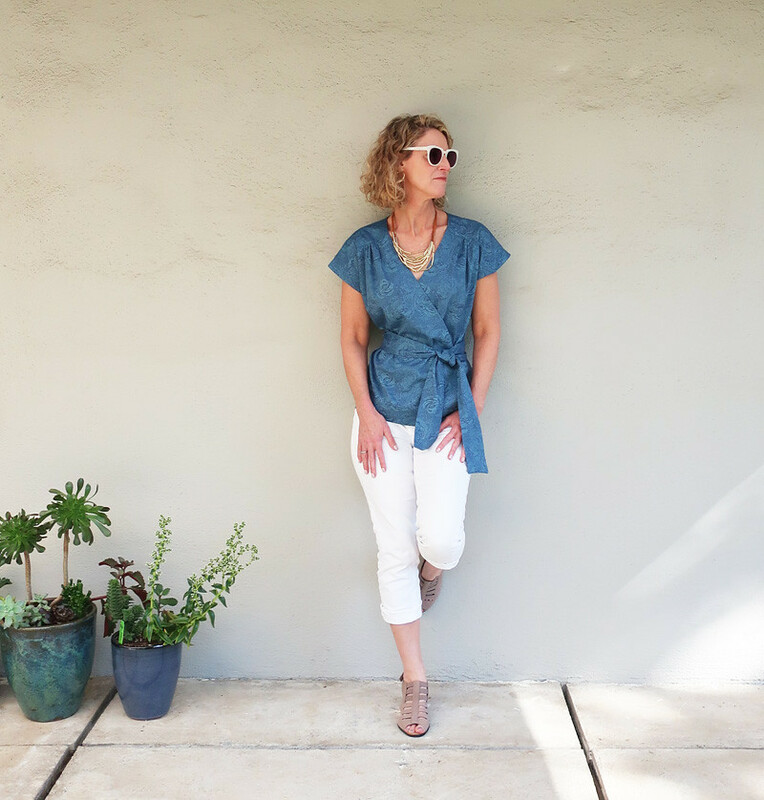 We were on a shopping excursion maybe 18 months ago and she bought a nice weighty silk crepe de chine at Piedmont Fabrics, and we've been on the lookout for the perfect pattern for ages. Certainly this one would need some fit adjustments. I tell people in my classes that 99% of people have to make some adjustments on all patterns. Not to be discouraging but it is highly unlikely that you are the exact combo of height, measurements and shoulder slope that the pattern company used in standard designs. 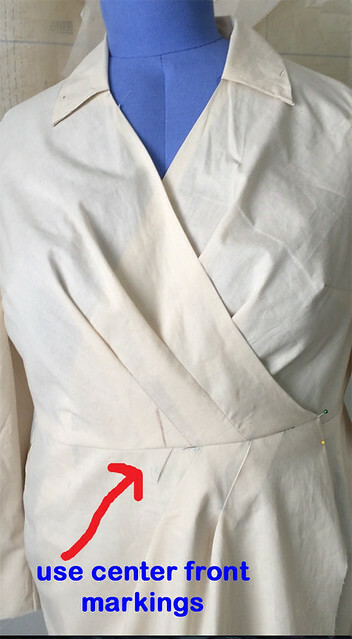 So I wish people would not be too discouraged but figure learning the fit adjustments is just one more step along with learning how to do a lovely zipper or a perfect pocket. Although the path to fit is certainly frustrating, disappointing, and even expensive. I've been there and I know. OK, not to dwell on that - moving on to this one. Heather is curvy and barely 5'2" so adjustments are in order. As would be almost anyone who is not 5'5". Or anyone with a full bust. So there we go - the most common adjustments are called for. Here's my muslin version # 1 sewn up and placed on the custom dress form. I could see it was too long in the bodice for sure and I just did a quick pin tuck because I wanted to see how it looked. You can see a line marked along the bodice edge, I believe I added there just for testing purposes. If you look closely you can see a small horizontal bust dart which I added when I did the FBA. 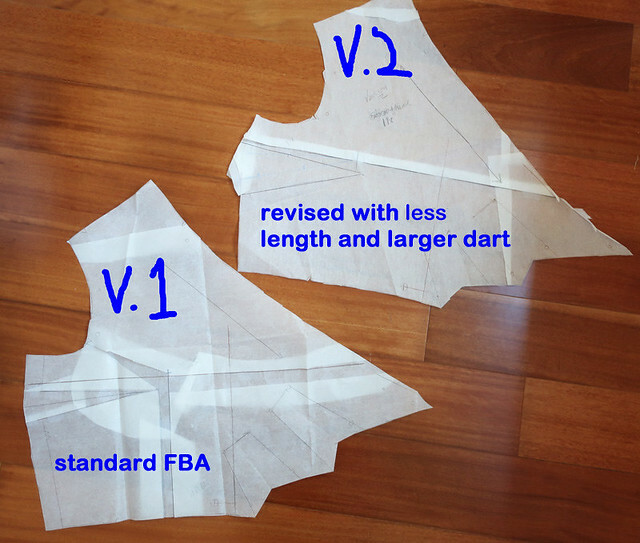 The 2nd version of the front pattern piece still has the FBA, I just traced that first version and then did my adjustments to the next version. And I'm not 100% what I did with the extra length, I think I traced and shifted to enlarge the dart and then folded out to reduce the overall length. Also interesting to note is the grain line on this pattern which is straight grain on the angled bodice edge, which keeps it from stretching if it were a bias edge. Here's the adjustments marked on the blue version. I marked on both sides of the dress but they probably aren't ever going to come out evenly, so I tend to mark both sides and take an average. Also that helps smooth over any area where the pinning is a bit awkward. My big innovation if we can call it that is to reduce the number of pleats in the skirt from 3 to two. Somehow on these wrap or overlay dresses I find the pleat nearest to the side seam tends to not drape but instead puffs out. Or it could be on a taller person it would work better. 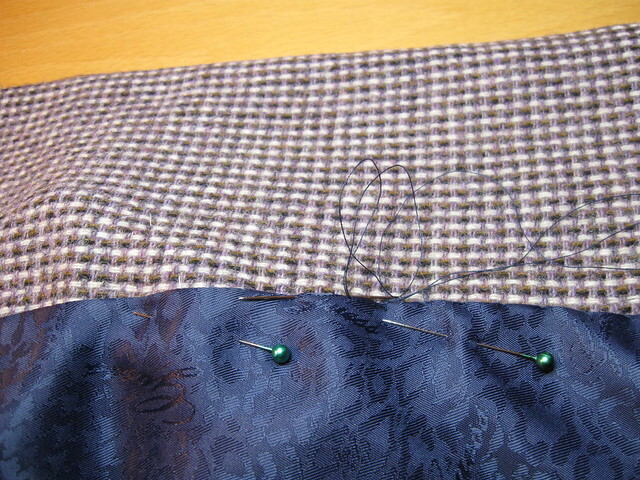 Anyway I shifted the take-up of the pleat to a front hip dart and am very pleased with that if I do say so myself :). Another innovation to come, continue reading! So here is test version 2. And even in muslin it's starting to look quite sharp. 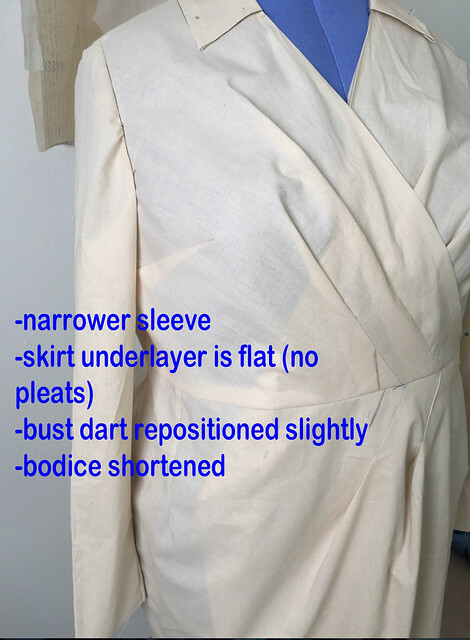 If you have a full bust then that bust dart is just about a necessity, and by putting that in it allows the bust to have room so it doesn't steal the fabric from the pleats which are sufficient for a B cup (as a standard pattern is designed) but with a curvy top half the body shape will take fabric from wherever it can get it. A bit of a convoluted explanation but hopefully makes it a bit clearer. You can see the hip dart, over near the side seam. But my innovation # 2 is to make the under layer skirt completely flat. No PLEATS! After all they are unnecessary there, totally hidden and thus the dress is lot smoother, less fabric bulk across the tummy where no one wants more fabric bulk. Even in a lightweight fabric like silk. Better look at the center front of the wrap. The pleats in the bodice are there on both sides, no change there. 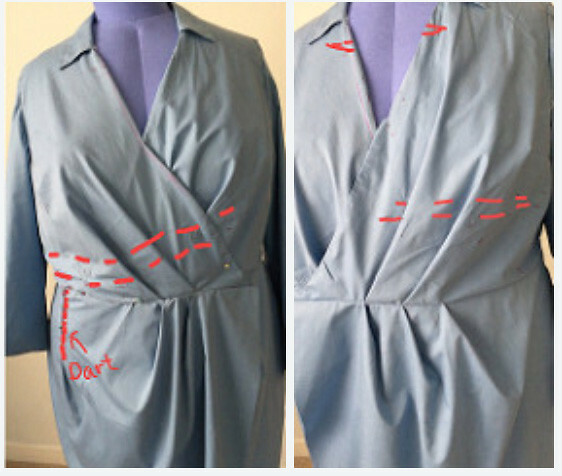 The key to fitting a wrap dress is to use that Center Front mark. By that I mean when you put on the dress, the center front marks must overlap and then you can see how much you might need to add in circumference at bust and/or waist. 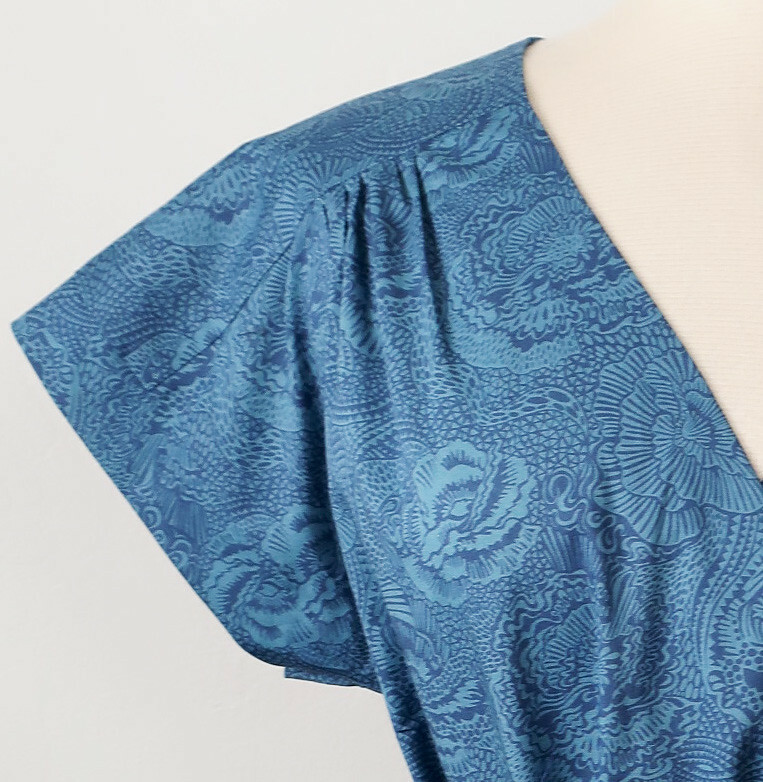 Also then the V-neckline has a chance to fit nicely with no camisole top required. I shortened the back by marking on the blue version about 2 inches at center back tapering to zero at the side seams (a standard adjustment for Heather's dresses) but the Test version 2 revealed that I was a bit overzealous in that area, so I added back a bit on my paper pattern pieces based on these markings. cut them apart, reuse the large pieces for small pieces on a next project and use the other scraps for chores like cleaning spiderwebby windowsills or other yucky cleaning tasks. Sneak peek at the dress - bodice is just about done and then I will attach the skirt pieces, baste on the sleeves and have a fitting session to determine any small adjustments plus mark the hem. I tried out a few colors of lining, beige, ivory and the navy blue and the blue gave a richer appearance to the silk. It's bemberg rayon which I really like for dresses and skirts. I saw somewhere, maybe on IG or an article in Threads that Kenneth King despises it? could I have that right? I wonder why. I really like it although I prefer a heavy acetate lining for coats and jackets. So that's what I'm working, as well as a top in Liberty cotton for my friend Alice, a new pair of burgundy color stretch jeans for myself, and prepping for my Jacket class on Nov. 3-4. One more mention of my upcoming Fitting class - last one until sometime in January. 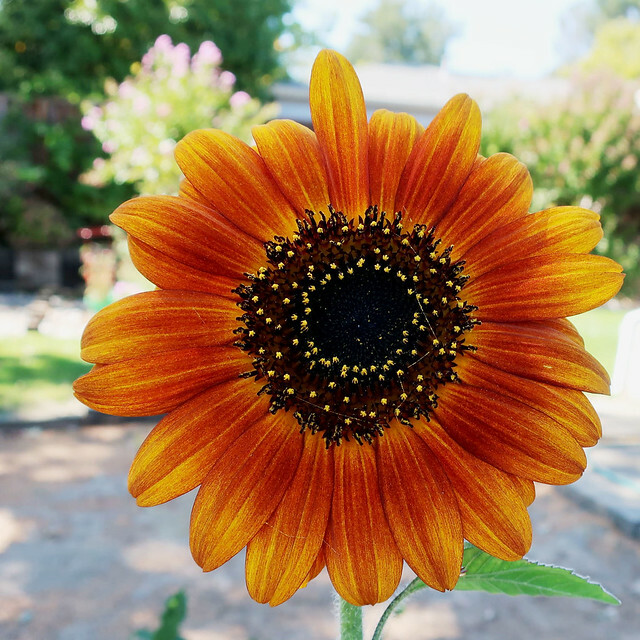 Today's garden photo - it's the end of summer but I still have a few sunflower blooms around. Love these in the autumn colors. In retail news - look what I saw on the shelf at Joann's. They have these magazines which I thought were only available in the UK. At least that's where I've seen various people post about them. And note the values mentioned in British pounds. I didn't buy either of them and couldn't find what they were being sold for. I'm guessing around $10-12. They both had 2 patterns so if I come across a future issue with patterns inside that I'm interested it perhaps I will buy one just to check it out. Any recommendations on magazine content between the two choices? I think most everyone listens to podcasts while they sew, at least some of the time. 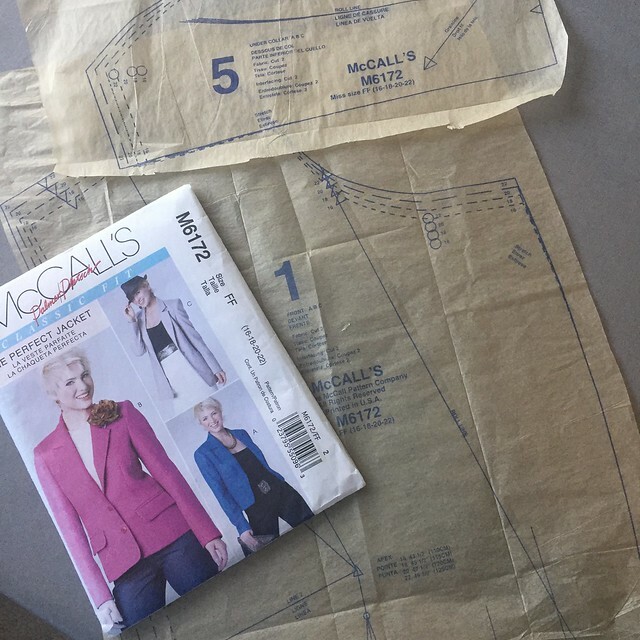 It's like someone invented a perfect medium for those of us who sew. I do watch tv or movies a lot when I sew also, but really it's more like listening than watching, so podcasts are ideal. Plus so many interesting subjects out there. I particularly like history podcasts as well as my bi-monthly dose of How Did This Get Made? where they review bad movies, so funny! A little RTW inspiration. One of my friends asked me to take up the hem a bit as she is quite short and it was too long for her. Cute, huh? I think it's from The Gap? or somewhere similar. 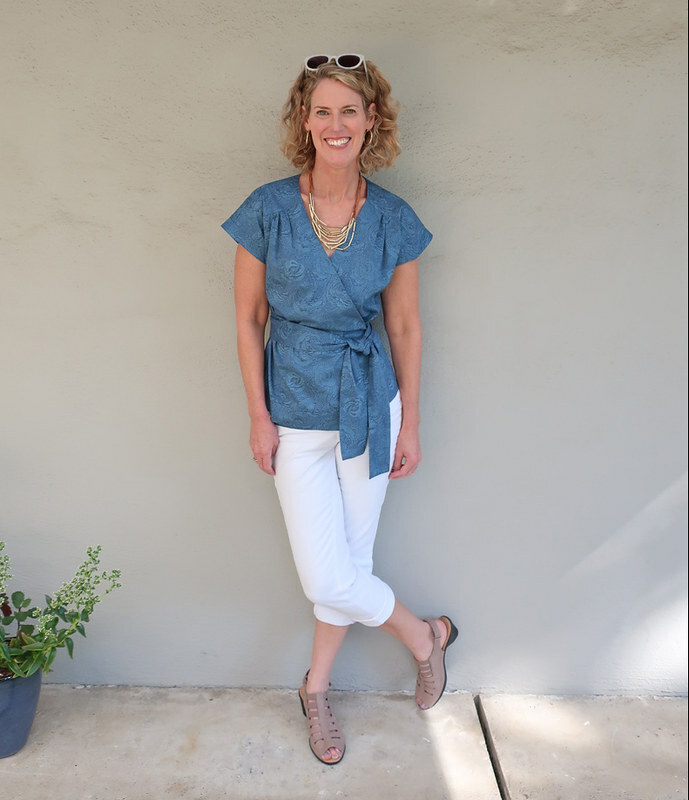 So simple, a V-neck chambray dress, with shoulder yokes and a tiny bit of gathering which take the place of a bust dart, and then the low v-neck in the back. Plus the tie element to keep it from falling off your shoulders. I really liked it and took pictures to remember this for next summer. Would work as a top or a dress. Someone remind me when May arrives to do this one! Which brings me to the next topic, do you have any qualms about copying RTW? 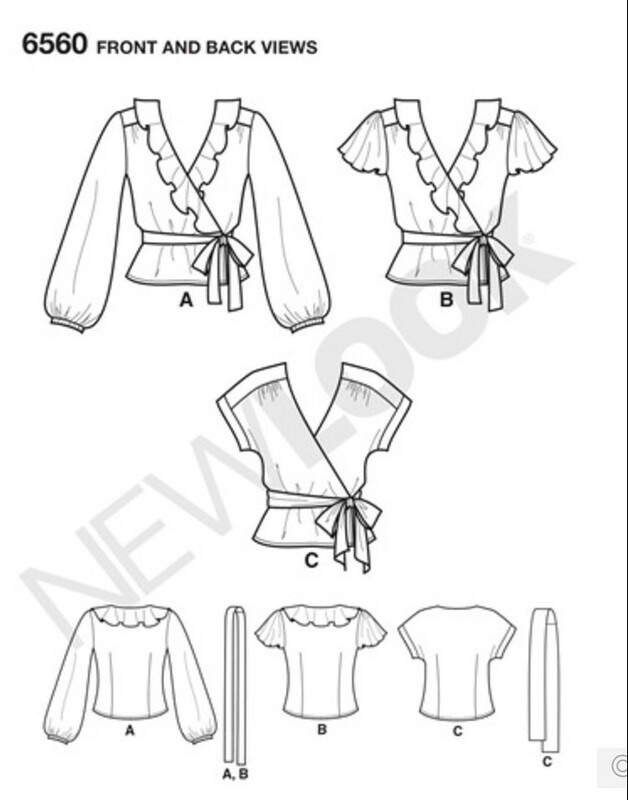 or recreating a sewing pattern and making it up on your own? I have no qualms about either, as I think fashion is so repetitive, there are not really any new ideas per se. A garment design or a sewing pattern is a compilation of various elements which all exist already. I can't remember where but I saw a discussion about someone wanting to make their own version of a pattern because the one available was not in the person's size range, and whether that would be problematic. I don't see any problem with that, and I venture to say that with a bit of searching the same pattern could probably be found in any size range. Perhaps an out of print or sort-of vintage. I love the IG @paperbagwaist as she shows how a current style can be found in a pattern. Her tag line is "There's a pattern for that!" and I couldn't agree more. This is where the line drawings are so helpful. It also makes me smile to see how many of the current garments she pairs with '70's and 80's patterns. 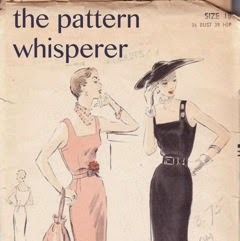 I need to rummage through that box of old patterns in my spare bedroom to see what gems might be hidden in there! Speaking of patterns - why are there so many sweatshirt patterns? File that under things I don't get. If I'm going to sew something it's not going to be a sweatshirt. I can see doing it for variety and utility but there are so many patterns for the same thing. I suppose it's like t-shirts, a lot of patterns and you can choose the pattern company that suits you best. 1 Yard wonders: a silly but catchy description of these dresses. For the last few dresses that I made this summer I happened to mention that I made them from 1 yard of fabric and got a few comments that people were surprised at this. I think all these dresses were sewn with 1 yard of fabric. Note that this is for 60" wide fabric. And these are all sleeveless dresses. Sometimes maybe 1 yard plus whatever extra gets thrown in with the cutting out at generous places. For me a relatively straight skirted dress is a length of about 35" from neck to hemline but most dresses aren't continuous pieces in that length. My hip measure is 42" so that means each front and back skirt piece is approximately 22" wide. You can see that if you fold the fabric with selvedges towards the center you can get the skirt pieces cut out with plenty of fabric remaining to cut out the bodice pieces. 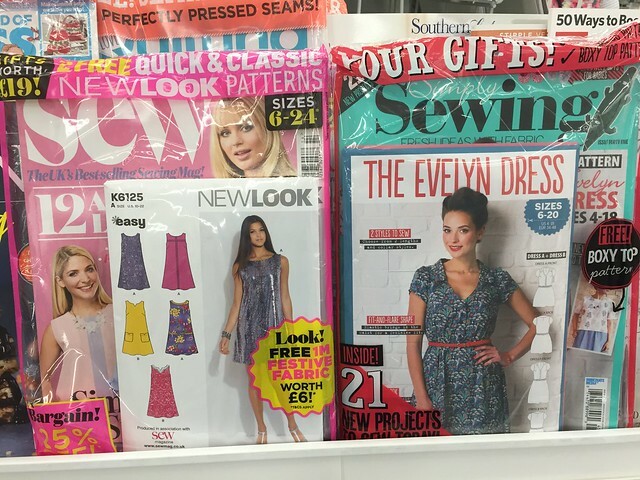 The dress in the 2nd and 5th photo are my beloved Butterick 5455. The first dress is a recent Burda magazine pattern, the middle one is a older Burda magazine pattern which I just made last month, and the 4th one is a Marfy pattern. I really enjoy the pattern puzzle of squeezing a pattern onto a small piece of fabric, although 1 yard is not small for me (note I'm relatively short and the fabric is 60" wide). Someone else asked "why shoulder princess seams" on a recent project which was a dress which I made for my muse, Heather. I have started calling her my muse as I think more lately about what I can make for her - always on the lookout for a pattern that suits her shape and her lifestyle. We have a great symbiotic relationship - I like making more formal and business-y clothes and she needs them for her job and her life. I certainly don't need any more things like that in my wardrobe so it's fun to do them for her. Anyway - back to shoulder princess seams. 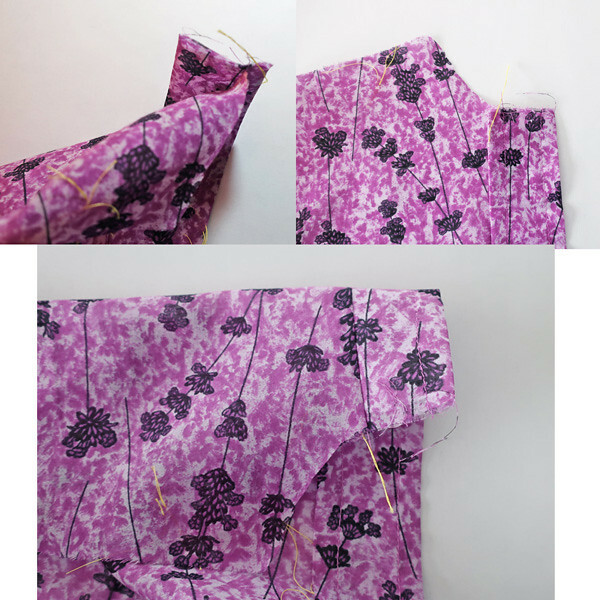 If you look at that post linked here you will see that I used a basic Simplicity armhole princess seam pattern but changed it to shoulder princess seams. I find they offer more adjustability over the bust, as well as being able to narrow the shoulders. Rather like this example. I find that women who are full busted and need more room in the chest don't necessarily also have width in the upper chest. In fact often to fit the bust then the neck and shoulders are swimming on them. 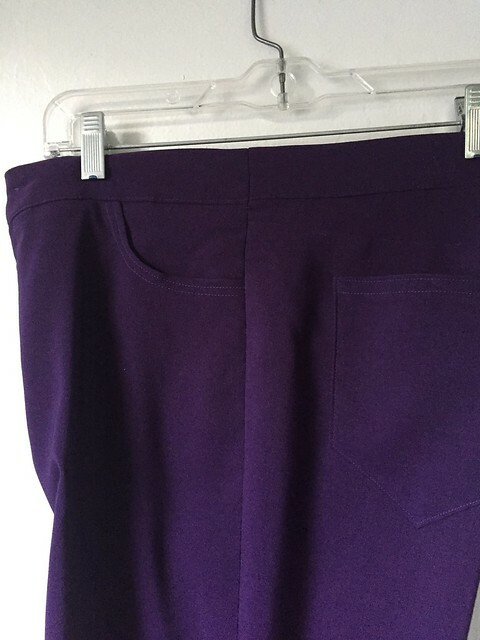 So a shoulder princess seam gives you the opportunity to narrow that area and have a nicer and more comfortable fit. Of course you need to start with the right size (use high bust measure) and also add a bit on the shoulder seam. 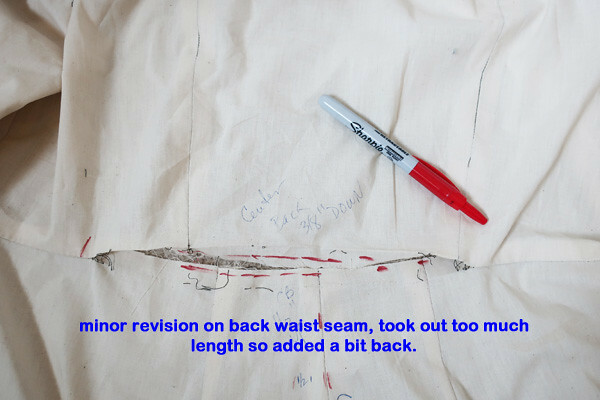 Because when you narrow the princess seam you will probably need a bit of extra seam allowance on the shoulder seam to get everything smooth. Inside the garment - do you care how it looks? I am constantly amazed at how much people stress over how the inside of the garment looks. Also a lot of people seem to get a great deal of pleasure over the inside, be it a cute fabric used for the lining or facings, or contrast seam binding covering every seam. While I want my garments to wear and wash well, the more important feature to me and the reason for every sewing technique I use is that they look perfect (or as near as I can get) from the outside!!! 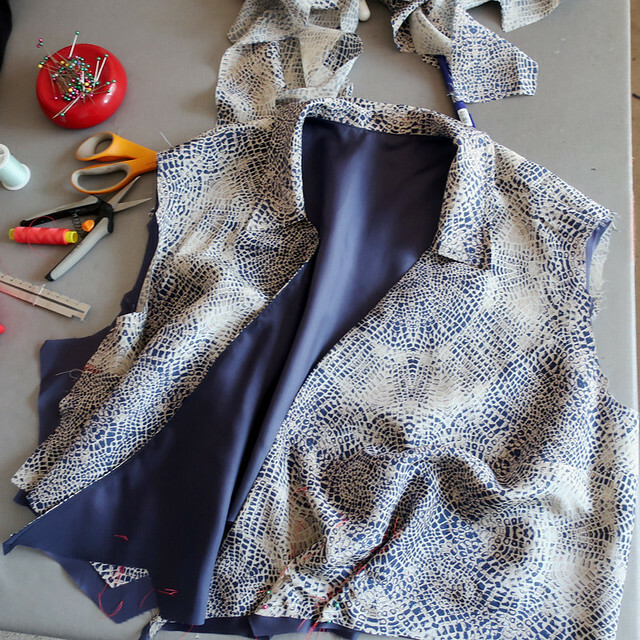 Now that I've been teaching a lot of classes I think that the slight fixation on how the inside looks could be due to the fact that when you are making a garment you are looking at the inside, and that's the focus of your attention. So a relatively new sewer sees the seam allowances and compares to their store bought clothes and wants them to be similar. But accurate sewing and good pressing at every step will do far more for the final result than worrying about the seam finishes. Admittedly it is fun to do a lovely french seam and a nice tidy row of serger stitches looks good and wears well but suggest thinking about the outside more than the inside. Hand sewing - love it or hate it? I guess this goes along with feelings about the inside of the garment. I happen to like hand sewing and don't have any issue with visible hand sewing on the inside. In fact I kind of like seeing it. Her I sewed the lining into the jacket by hand. This fabric hides a lot which in a solid color would probably show more. The thing about hand sewing is like anything else, it takes practice to get it just right. It gives you a different type of control than when you sew by machine so I think that's why I like to use it, for hems, putting in linings. etc. Anyway, give some hand sewing a try and you might really enjoy the feeling of needle and thread in your hand. That's all of my topics today, I didn't even mention the new fall patterns, because I haven't seen anything that really jumped out at me at first look. Which if history is any guide in about a month I will have a couple of things I absolutely must make! 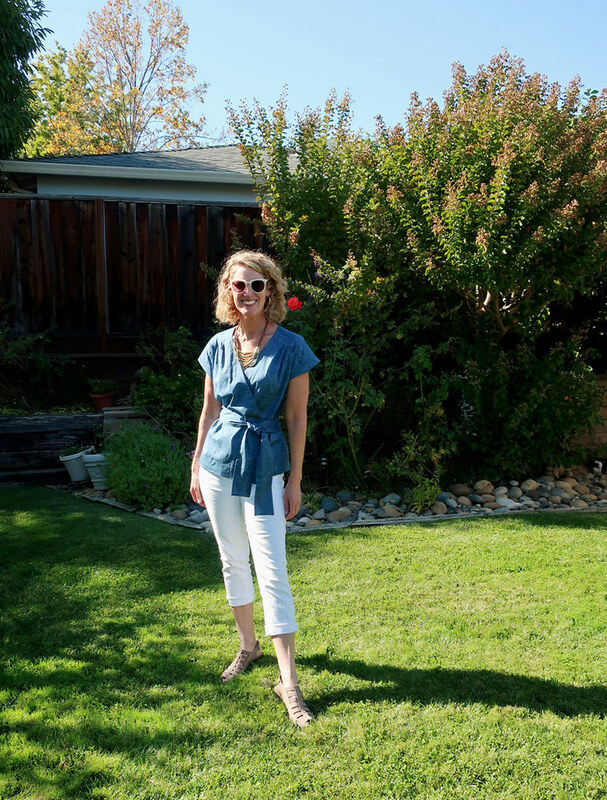 Up next, I just finished a blouse in Liberty cotton/silk lawn, it's quite nice but I don't get the fuss about Liberty. More in that upcoming post. And then onwards to jacket and coat making. 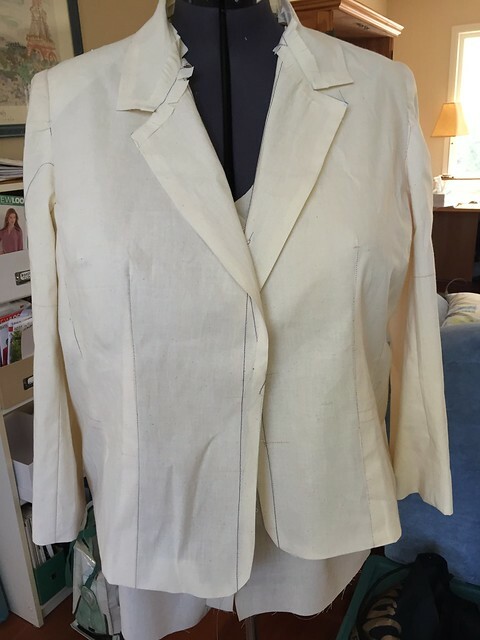 A new wool jacket for me (OK I did see a pattern in my Oct. Burda I must sew) and a blazer jacket for Heather. 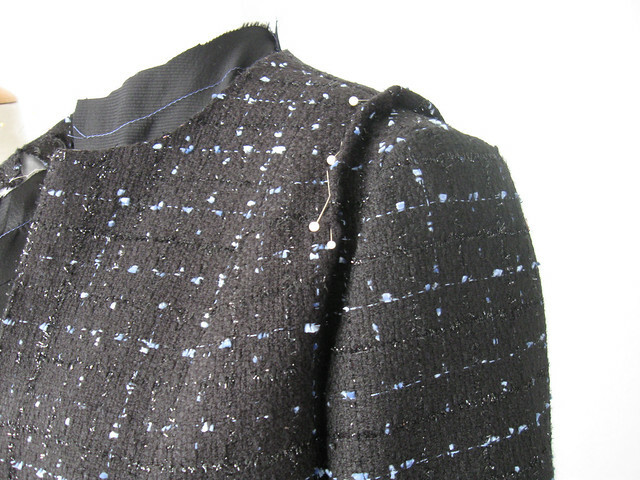 My weekend coat/jacket making class at Hello Stitch on Nov 3-4 is filling up, here's the link. We have the last Pattern Fitting class for 2018 coming up on Oct. 14, with a few spots still open. 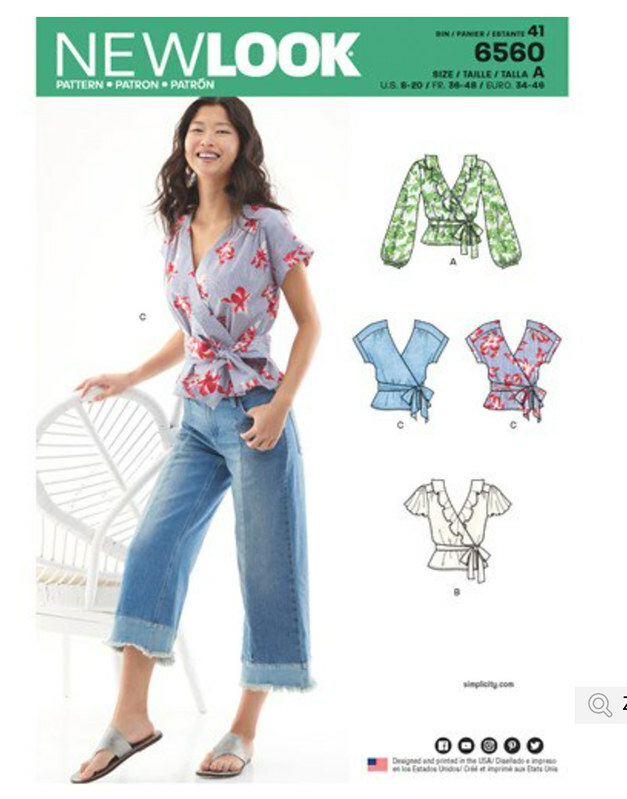 In December we added another Lander Pants class as well as a Kimono jacket - here's the page for all the classes at Hello Stitch Studio. 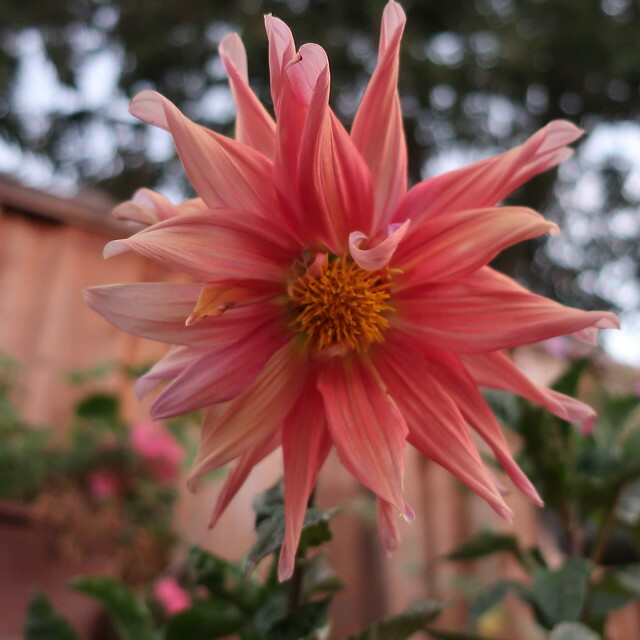 Today's garden photo, another dahlia before the summer weather ends.